Replacement Putty & Tray for Sportsguard Custom Fit Mouthguards. It can be used for all Sportsguard and GrindGuardPM mouthguards. Our replacement putty and tray can be used to remake another impression of your jaw if you aren't comfortable with your initial impression. It can be used for all Sportsguard and GrindGuardPM mouthguards. Comes with two different sized trays, putty mix, and instructions. This important first step is how we will get an impression of your teeth from which we will make your custom fit mouthguard/night guard. Please read through ALL the instructions BEFORE starting the impression process. Please complete two sets of impressions. 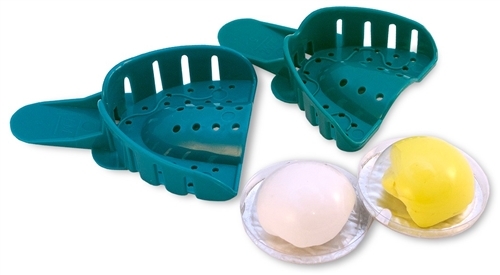 After completing these instructions, you will have two dental impression molds of your teeth that will be returned to us using the provided pre-paid shipping box (U.S. Customers Only). We will evaluate both impressions and determine which is the better of the two. From that impression, your form-fitting mouthguard/night guard will be crafted and shipped back to you. You should receive your mouthguard/night guard in 2 – 3 weeks. If you have questions or problems, please contact Sportsguard/Nightguard Laboratories customer service. CAUTION: Do not use with braces, removable dental appliances, or loose teeth. If under 18, adult supervision is recommended. Place each tray in your mouth to determine which offers the best fit. Choose the tray that you can comfortably bite down upon with your molars contacting the bottom of the tray and your lips extending over the front of the tray. Place the tray in your mouth AT LEAST 3-4 times until you are comfortably and effortlessly able to contact your molars to the bottom of the tray and get your lip over the front. Carefully remove the putty from both packets taking care that the putties don't come in contact with each other or the tray. With all the contents of the kit close together, the impression process will go smoothly. Have a 2 minute timer available. Take both putties and knead them together. Mix them together as quickly as possible until they are combined into one solid color (there should be no white streaks). This should take no longer than 30 seconds. As soon as the putties have been properly mixed, immediately roll the uniform putty into a log shape that can evenly cover the arch of the tray. As soon as the putty has been properly placed into the arch of the tray, insert the tray the exact same way as you practiced in step 2. Push the tray into your teeth by pressing the BOTTOM of the tray (NOT the handle) until your molars have made contact with the tray. The putty should wrap all around your gum line. Is is important to not allow the tray to shift position once properly inserted in your mouth. Once in place, gently hold the tray in your mouth for 2 minutes. After 2 minutes, remove the tray and impression with both hands by gripping the handle with your index and middle finger, and your thumbs underneath your front teeth. (It should take a bit of effort to pull out). Check your impression for a few critical properties. The putty is one solid color. At least one molar is visible in the impression. The gum line is clearly visible above each tooth including at least one molar and the putty is firmly set in the tray. If you are unsure if your first impression is suitable, email Sportsguard/Nightguard Laboratories a picture and we will evaluate it and offer tips for success before you make the second impression. Be sure to complete and return both impressions. Our dental lab technician will decide which will work best. Copyright © 2013 Sportsguard Laboratories, Inc.. All Rights Reserved. Ecommerce Software by Volusion.